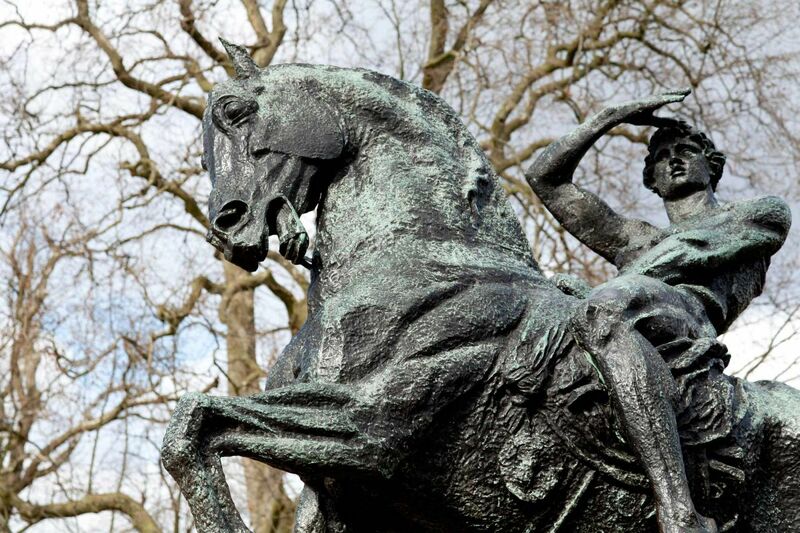 This bronze statue of man on horseback is called Physical Energy and is the work of the British artist George Frederic Watts (1817-1904). Watts had very high ideals for his art, and intended his work to help humanity embrace progress. Physical Energy is an allegory of the human need for new challenges – of our instinct to always be scanning the horizon, looking towards the future. In the artist’s own words, it is ‘a symbol of that restless physical impulse to seek the still unachieved in the domain of material things’. The original plaster model for the sculpture can be seen at the Watts Gallery – Artists’ Village in Compton, Surrey. Watts worked on this for some twenty years, from 1883 to his death in 1904. 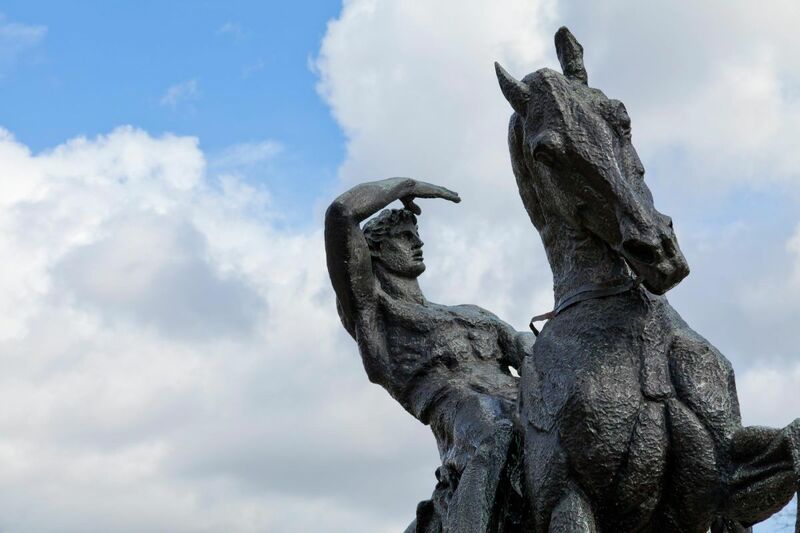 The model was first cast in bronze in 1902-4 to form part of the memorial at Cape Town, South Africa, to Cecil Rhodes, the founder of Rhodesia, now Zimbabwe. Rhodes left his fortune to Oxford University to fund the Rhodes Scholarships. 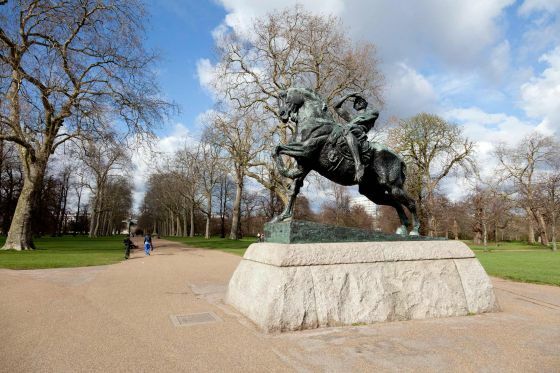 The cast in Kensington Gardens was erected in 1907 by Watts’ widow and friends as a memorial to the artist himself, who had lived for very many years in Kensington. 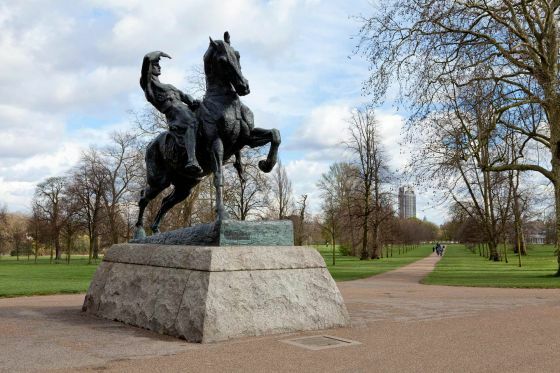 A third cast of the sculpture was made in 1959 and is now in Harare, Zimbabwe, and a fourth was commissioned in 2017 by the Watts Gallery to be sited at Compton, where G F Watts had his country house. By the 1820s, Kensington Gardens was open to the public all week. They became a place to commemorate the nation's heroes. From here, you can also see the Albert Memorial, a memorial to Queen Victoria's husband, Prince Albert, which was built at the end of Lancaster Walk from 1863-1872.